Big congrats to user KMKeto who lost 110 pounds with Carb Manager. Her story moved and inspired us. Way to go, KM! 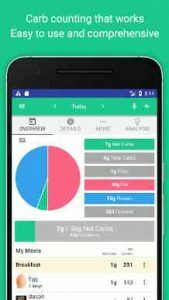 Carb Manager is the world’s easiest and most comprehensive low carb tracker and macros counter for anyone on a low carb diet or keto diet. We’ve compiled nearly 1 million verified foods in our database, including brand name products, Atkins diet products, and restaurant fare, and created an indispensable resource for thriving with your low carb diet lifestyle. As a net carbohydrate counter, Carb Manager is unsurpassed. With a few taps, you can search our fast and extensive food database, which includes easy to find common foods, supermarket foods, and restaurant dishes. Use the barcode scanner to quickly count carbs. You can also input your own custom foods, or bundle foods in low carb recipes and meals. Additionally, we’ve included 350,000 healthy recipes with instructions and nutrition info, all ready to add to your food diary. This diet tracker includes state-of-the-art ways to log foods via search, camera, and voice. Scan a barcode to log nutrition info. Snap a picture of your plate to quickly calculate the carbs. Even use your device’s microphone to say what you ate, and we’ll instantly add it to your food log. But even more than a carb calculator, Carb Manager is your one-stop destination for living a healthy low carb high fat diet (LCHF) lifestyle. We’ve bundled low carb diet articles, forums, recipes, a meal planner, an e-book, and much more. Whether you are on a keto or ketogenic, Paleo, Atkins, Whole30, or other low carb diet, Carb Manager can help you stay motivated and aware of your health. Carb Manager also can track all of your macros, including protein, fat, and calories, so you can properly balance your diet. Carb Manager is also used by thousands of diabetics for carb counting to control carb intake. Track blood sugar, ketones, and net carbs to get a overview of your health and help manage your diabetes. * Some features require a Premium subscription for unlimited access. Easiest way to track and manage your diet/food intake. So easy to look up new food items – search by name or scan the label! A great aid for low carbers/ketogenic eaters. No more lists, no more looking for paper or pen to keep track of foods or running totals. Not sure if you can eat it? Look up what you want. Down 50 in the last 12 weeks. Easiest time at Induction ever. Love it! It’s nice to be able to track my NET carbs w/o having to hack the web reports from another app to see what I’ve eaten in net carbs. I really like the scan feature too. And I’m able to add my own recipes and a can even add foods & their macros myself (although I don’t, cuz most likely its already there). I like being able to track my weight loss. & I would like to track my BP & stuff too but I think u save to upgrade for that.